I'd like to thank the Selection Committee of the American Hosta Society for choosing me to receive the Eunice Fisher Distinguished Hybridizer Merit Award. I've had a thirty-five year love affair with hostas, and a twenty-two year passion for creating new cultivars. I've been a lifetime member of the American Hosta Society since 1986. I have many cherished hosta friends of long duration. I would like especially to acknowledge five of those friends. The first is my wife, my life partner and garden partner, Jane. She, like me, is a real dirt gardener. I mainly take care of the hostas. She is in charge of the perennials and the non-hosta companion plantings. She does the planning and pruning, and takes many of the garden photographs. She names almost all of the cultivars. She is a hosta cutleaf show master judge. The other four people who have been role models for both of us are: Herb and Dorothy Benedict, and our longtime friends, Van and Shirley Wade. The Wade and Gatton Nursery is the repository for all of our cultivars, and also for seedlings still under observation. When Jane and I scaled down to a smaller house and garden in 2006, our beautiful foundation plantings of trees and shrubs also came from Wade and Gatton. 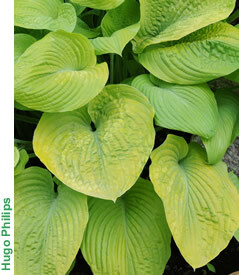 I began my first hosta garden in 1975 after a visit to Hatfield Gardens near Circleville, OH. I soon became a hosta addict and collector. In 1986, my garden was a national convention tour garden. In about 1988, Bill Brincka, Gil Jones, Handy Hatfield and I took a tour of East Coast hosta gardens. When we visited the garden of Eleanor and Bill Lachman in Amherst, MA, Bill gave me a demonstration of how to hybridize hostas. He showed me how to prepare a pod parent for cross-fertilization by first selecting a flower from the pod parent plant that would open the following morning. All petals would be removed from the flower, leaving only the stamen, to prevent bees from landing on, and pollinating, the flower. Pollen from the pollen plant would then be applied by hand to accomplish the cross. Of course, after this lesson I couldn't wait to arrive home and begin hybridizing. 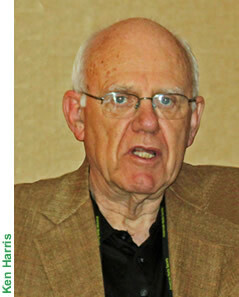 I learned from Kevin Vaughn how to obtain variegated seedlings by using unstable streaked plants as pod parents. The streaked plant first available to me was Mildred Seaver's 'Beatrice'. 'Beatrice' yielded many variegated seedlings, but unfortunately, almost all of these had very poor substance. One of the crosses yielded a plant with good substance, which is 'Irish Eyes'. Kevin Vaughn crossed 'Beatrice' with 'Frances Williams' and got his wonderful breeding pod parent, which he ultimately named 'Breeder's Choice'. He kindly gave me a division of that plant. My 59th seedling of 'Breeder's Choice” was designated '59 BC' on its tag. I subsequently gave a division of '59 BC' to a friend from England, Ian Chrystal. Ian then shared it with Sandra Bond, a noted British hybridizer, and Sandra asked Ian to name the resulting stable cultivar. Ian thought about what was happening in the year 59 BC. It occurred to him that this was Julius Caesar's childhood, so the plant became known as 'Little Caesar'. One of the plants I obtained from '59 BC' is 'Lorelei'. When Kevin Vaughn registered a streaked unstable cross between 'Breeder's Choice' and 'Frances Williams' as 'Pinstripe', I purchased a division from Hatfield Gardens and used it as a pod parent. Among the cultivars I obtained are 'Merlin', 'Frank Fetch', 'Grace McClure' and 'Amazing Grace'. Another productive cross for me was 'White Vision' × H. montana macrophylla. This produced 'Alice Gladden', 'Stardust', 'Great Lakes Gold' and its tissue culture sport, 'Monsoon'. To create a large gold plant, I used the pollen of H. montana macrophylla on 'High Noon'. This cross produced ' Midnight Sun', which glowed at dusk in the garden. Some blue cultivars include 'Am I Blue' from 'Reginald Kaye'. Both 'Ice Palace' and 'Rocky Fork' are open-pollinated seedlings of 'Buckeye Blue'. 'Kind of Blue' is a garden seedling. 'Spellbound' and its tissue culture sport, 'Shirley Wade'. 'Pinstripe Sister' also produced two stoloniferous cultivars, 'Firefly' and 'Jiminy Cricket'. Two plants resulting from a cross between 'Pinstripe Sister' and H. montana macrophylla are: 'Jane Ward' and a streaked, unstable plant, 'Zany Janie'. We have a number of 'Zany Janie' seedlings under observation at Wade and Gatton Nursery. Some of these have stabilized and will be registered this year as 'Beautiful Dreamer', 'My Romance', 'Shall We Dance', 'Over the Moon', 'Satin Doll' and, registered last year, 'Hearts and Flowers'. 'Hearts and Flowers' has variegated seed pods, and produced 35 seedlings this spring, now at Wade and Gatton Nursery. Two seedlings created from 'Liberty' are 'Too Darn Hot' and 'Top Dog'. Three open-pollinated seedlings, now registered, that came from 'Sagae' are 'Dark Tower', 'Ivory Tower' and a large gold mound, described by Mark Zillis in his catalogue as “acts like a brighter, smaller version of 'Sum and Substance', with more heavily corrugated leaves”. This hosta is my selection as The Eunice Fisher Distinguished Merit Hosta, and its name is 'Fat Cat'. Again, my thanks to the committee members of the American Hosta Society who have chosen me for this honor.